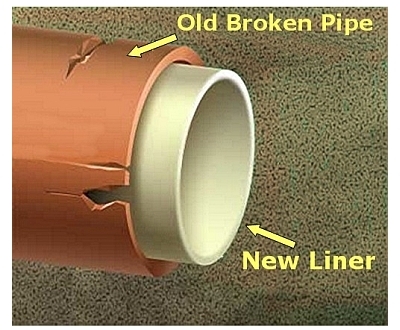 Cured in place pipe (CIPP) lining is the quickest and most cost effective way to restore damaged pipe lines. According to the Environmental Protection Agency, there are about 240,000 water main breaks each year in the U.S. alone. Since this is a trenchless process, pipes are able to be renewed with little disruption to traffic or to the residential area. It also eliminates the risk of causing damage to any surrounding services in a deep excavation process. CIPP lining adds 50 years to the life expectancy of the pipe. To begin,the pipe is cleaned with a high pressure water hose and a video camera is inserted to diagnose the problem. The video will allow contractors to decide whether or not the problem can be fixed with lining or if the pipe needs to be replaced. If it’s determined that CIPP lining can be done, a polyester or fiberglass sleeve is impregnated with resin and is inflated with water or air. The liner is inserted into the pipe, and using air pressure,turns the liner inside out, which allows the resin to connect with the pipe. Once this is done the resin needs to be hardened, and can be done so with heat, steam, or using UV light methods. The UV method uses light chains that allow curing times of 5-8 feet per minute. Once the liner has been cured, the laterals must be reinstated. This is done using a video camera and a remote operated cutter.